Delaware voters say that career preparation and high-quality early learning are key strategies for improving local public schools, according to poll data collected by GBA Strategies in partnership with the Vision Coalition of Delaware. The Statewide Survey of Public Opinion on Education in Delaware, which was conducted by landline and cell phone between May 17 and May 19, captured the opinions of 400 Delaware registered voters on a range of education issues—and is aimed at informing candidates running for public office during a critical election season. GBA and the Vision Coalition unveiled the poll results at a pair of events on Wednesday, August 3. To read the full summary, click here. For raw data, click here. Among other findings, the survey results showed that Delaware voters want greater investments in public education and more supports for students and families. 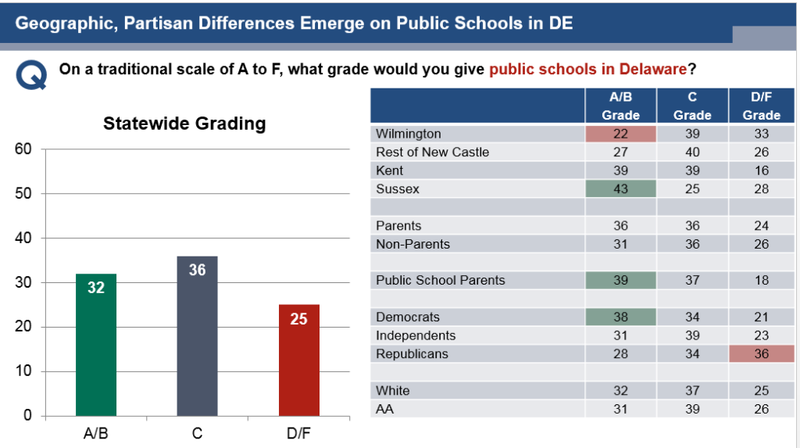 Overall, survey respondents gave Delaware public schools mixed ratings. Results found that Delaware voters are in search of greater investment in education and student support. 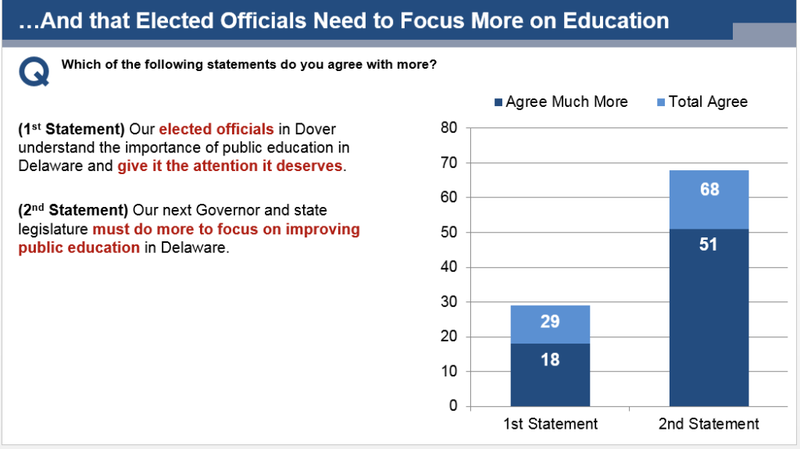 Of those polled, 54 percent believe Delaware spends too little on public education, and over two-thirds believe that elected officials need to focus more on education. Most viewed public education in Delaware as stagnant—not significantly improving or getting worse. Respondents gave poor marks to Delaware public schools in the areas of college and career preparation, and providing students with non-academic supports. Additionally, the needs of parents, teachers, minority students, and students living in poverty are not being met, according to respondents. But Delawareans surveyed also showed strong support for a broad range of policy proposals to improve public education in Delaware. 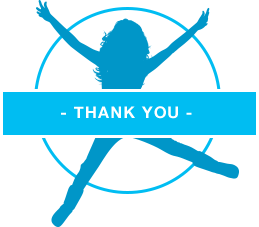 Specific proposals that are at the center of the policy debate in Delaware—including voluntary pre-kindergarten for all students, raising starting salaries for teachers, and major new investments in wireless and broadband technology—received strong support. According to the survey, voters are very focused on the needs of students in high-need communities. They believe it is critical that schools in these communities provide non-academic supports such as counselors and social workers, and strongly support proposals to boost these schools with extra funding and expert teachers. A majority of respondents endorsed the strategies outlined in Student Success 2025, the 10-year plan published by the Vision Coalition last fall. Strategies that receive the most intense support include investing in quality early learning, ensuring education meets the individual needs of students, and preparing students for life after high school. When asked what will ultimately have the greatest impact on improving public education in Delaware, respondents identified access to high-quality early learning as their top choice, followed by personalized learning, higher standards for teachers, and fair and efficient funding. In light of the state’s budget deficit, the majority of respondents were in favor of raising taxes on individuals making more than $250,000 annually, and most showed support for sharing services such as transportation and technology. The Vision Coalition will host its 9th Annual Conference on Education on November 14th at the University of Delaware’s Clayton Hall.